Standalone tone generator board for your KITT replica. Adds life or functionality to any push button in your dash, upper console, lower console or switchpods. 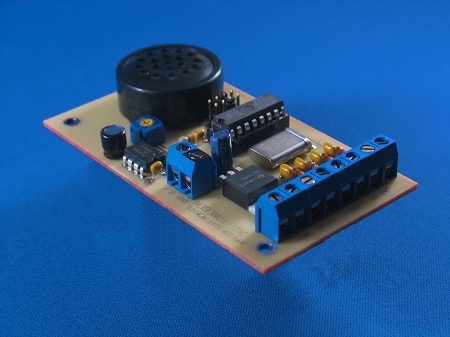 This board generates 4 different tones and can be used with an unlimited number of momentary push buttons. Operates from 9 to 15Vdc, 12Vdc typical. Adjustable volume, selectable tone frequency. You can use 2 or 3 of these generators together and set each to a different frequency in order to have 8 or 12 different tones. NEW! More compact unit. Board size is 3.5 x 2.0 inches or 88 x 50 mm.